Blog not doing well in Search Engine? It’s because you’re not optimizing your blog for search engine. Search engine optimization is must follow topic for every blogger who need to get traffic from search engine. Ping is also a topic of search engine for noticing your blog post to search engines by saying I’m having a new content crawl me!. There are so many ping website are there to ping your site, today I came to one more nice ping site called BlogBuzzer. BlogBuzzer is one of such ping website helps to notify your site content to top most search engines and even blog directories, the good thing about blogbuzzer is, it pings most of the top search engine as well some directories (most of the ping sites never ping directories) too what we don’t know about it. 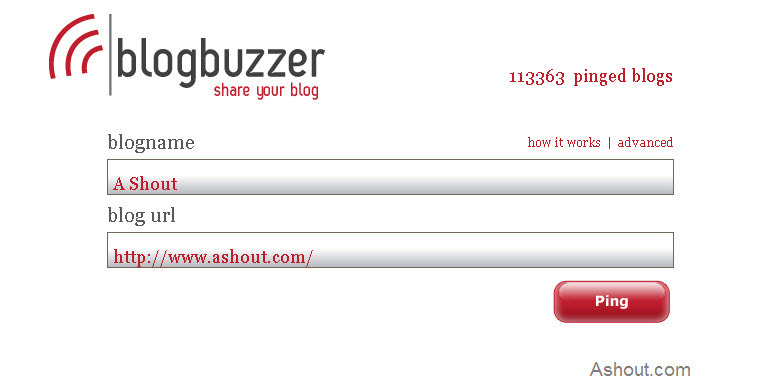 To use BlogBuzzer you don’t need any technical skills, just go to blogbuzzer.com and enter your blog name and blog URL and click PING button, that’s it. Now your blog new content will get noticed by different search engine and directories. How to use blog buzzer ping website to ping your blog. I can say Yes and No, because it is offering free and premium service. The only difference is free users need to ping blog manually and premium users don’t. So, we can get the benefit of all features of premium users expect Auto ping. If are lazy to submit your blog URL manually then go for premium subscriber it cost only US$9 per year, it’s really cheap price and every one can go for premium. What company is say about it? Blog Buzzer is a FREE easy to use tool that helps authors of blogs get their work noticed. Most blog entries are found by other internet users through search engines and blog related directories. Blog Buzzer will automatically send your blog to these directories and search engines for you. Hope it helps to ping your blog, do share your opinion of blogbuzzer.com in comments. Which service do you recommend to ping blog? and which service do you using for ping purpose? This post is written in service exchange, although all the views pointed out are of the author himself and was in no way affected by the nature of the post. If you want to get your product reviewed then please contact the admin. Google by itself decides when to crawl a website. For other search engines this service will be very useful. This blog buzzer is not only submitting our blog to goolge but also submit to other search engnie as well. It might helps for other search engine. Search Engines checks randomly the sites they have in their index for updated content. Even after submitting your blog to search engines, when you update your blog and post new content, it doesn’t necessarily mean that it’ll be checked in real time or the moment you submit your post unless you ping your blog through some (Blog) Pinging Servers. Sure dude, I think it might help your blog in Search engine. I’m already part of it.